Advantages are guaranteed thanks to features like highest peak-output gate current, best isolation and fast shutdown. Power Integration just announced the SIC1182K SCALE-iDriver™. This new technology is a high efficiency, single-channel silicon carbide (SiC) MOSFET gate driver which ensures to the deliver the greatest peak-output gate current available without an external boost stage. This comes as no surprise as Power Integration is a leader in gate-driver technology for medium- and high-voltage inverter applications. Devices can thus be worked on to support different gate-drive voltage requirements matching the range of requirements as seen in SiC MOSFETs today; key applications include welding inverters, photo-voltaic systems, power supplies and servo drives. The SIC1182K provides as high as 8A output with a junction temperature of 125⁰C; thus giving these devices the liberty to support SiC-MOSFET inverter designs up to several hundred kilowatts in the absence of a booster stage. This allows for high efficiency of the system and allows customers to make only a single design to cover their portfolio of differently rated power inverters. At a switching frequency of 150kHz, it becomes possible to support multiple applications. The new product features FluxLink™, a high-speed communications technology by Power Integrations which is rapidly increasing isolation capability. FluxLink is literally a signal for a new dawn as it replaces optocouplers and capacitive or silicon-based solutions, improving reliability and better isolation of up to 1200V. 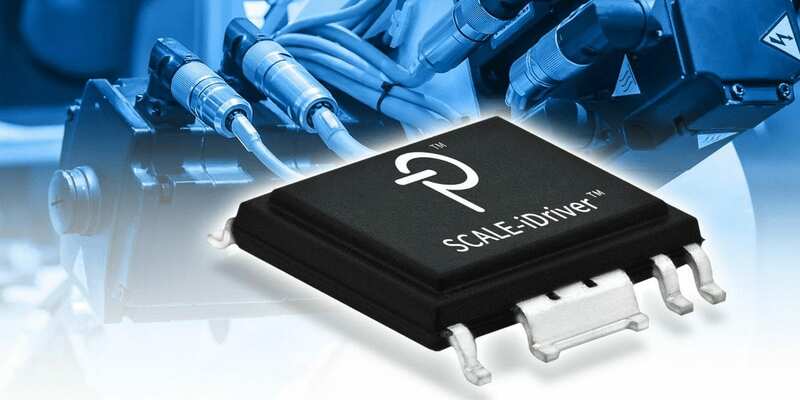 Scale i-Driver devices also include features for system-based critical protection such as current SENSE read out, desaturation monitoring, Advanced Active Clamping (AAC), as well as primary and secondary undervoltage lock-out (UVLO). The product has protection circuits that guarantee a safe shutdown as fast as five microseconds, satisfying the need for quick protection of SiC devices. The gate drivers for the product also show forth high levels of immunity to magnetic fields, with a package that provides ≥9.5mm of clearance and creepage; making use of materials with the greatest CTI level, CTI600, to IEC60112. On the overall, the features of the new product allows for a decrease in size and weight, a reduction in power losses of the inverter systems, a safe and cost-effective design, and maximal efficiency.